Anindita Kishore took early retirement from a successful civil service career, to paint. Painting, a passion that she treasured since her childhood, steadily gained in intensity through subsequent years. 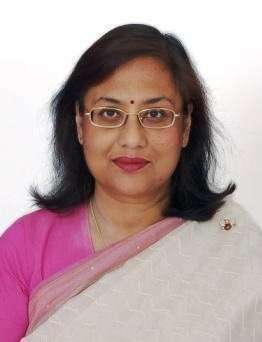 She has a wide academic background; of knowledge in literature, history, management art history and fine art, obtained from prestigious institutions in India and abroad. She is a trained Enamelist and Artist whose artworks span oils, acrylics, inks on canvas and paper, vitreous enamels on fine copper & silver and industrial enamels on steel. Techniques, peculiar to any of the mediums she uses, often influence and seep into the shapes and forms in her paintings in the other mediums in her repertoire, adding both interest and cohesiveness to her work. In her copper enamel paintings she uses a variety of techniques such as metal forming, cloisonné, copper & silver foils, sgraffito, stencils, sifting, wet pouring, enamel crystals, threads and millefiori. The brilliance of enamel colours and techniques can be seen in her canvas paintings also. Inspiration for her paintings comes from her extensive interest in philosophy, cosmology, environmental issues and the endless expressions of the human nature. She believes in regular practice, assiduous reading, development and innovations in her artwork. She also keeps her knowledge of art and its techniques updated and current through frequent participation in art related workshops, camps, demonstrations and events. She is a life member of the Enamelist Society, India, and a member of the Forum of Indian Photographers and Artists, India. Her artwork has been exhibited in 46 shows, several in premier galleries like the Tao Art Gallery & the Prince of Wales Museum Art Gallery, Kala Ghoda, in Mumbai and the Visual Art Gallery & the Open Palm Court, IHC, the Gallerie Romaine Rolland, Alliance Francaise & Lalit Kala Akademy in New Delhi & Amdavad Ni Gufa, Ahmedabad, in India and in NYC, USA and St. Petersburg, Russia. She has been selected thrice in Juried Art Competitions, held by private galleries & institutions, at the National level and four times at the International level. Her artwork is in private collections in India and abroad.